Curated by non-profit organization Art Production Fund, which presents art to the public nationwide, this pop-up experience features an interactive installation from renowned artist and architectural designer, Jenny Sabin and her practice, Jenny Sabin Studio, that showcases contemporary design and the evolution of creative expression. In addition, interactive curated events across art and culture are offered to visitors within the space. House of Peroni kicked off October 19 – 20 in New York City’s West Village before traveling to Los Angeles, Miami, and Washington, D.C. for a series of one-day events throughout November. LUSTER is a responsive canopy structure with integrated hightop bars and lounge area with seating. Platforms and a single tower structure house the Peroni bar service area. 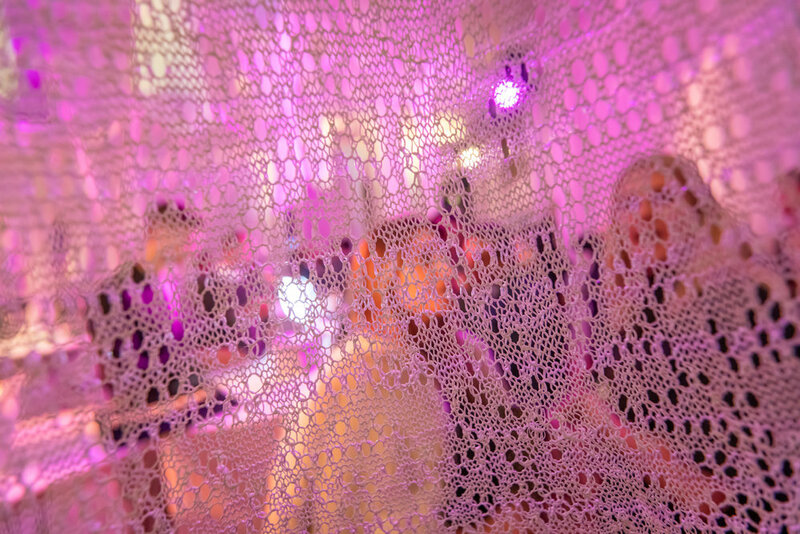 LUSTER is luminous and radiant knitted light, immersing visitors in a responsive glow of photoluminescence. 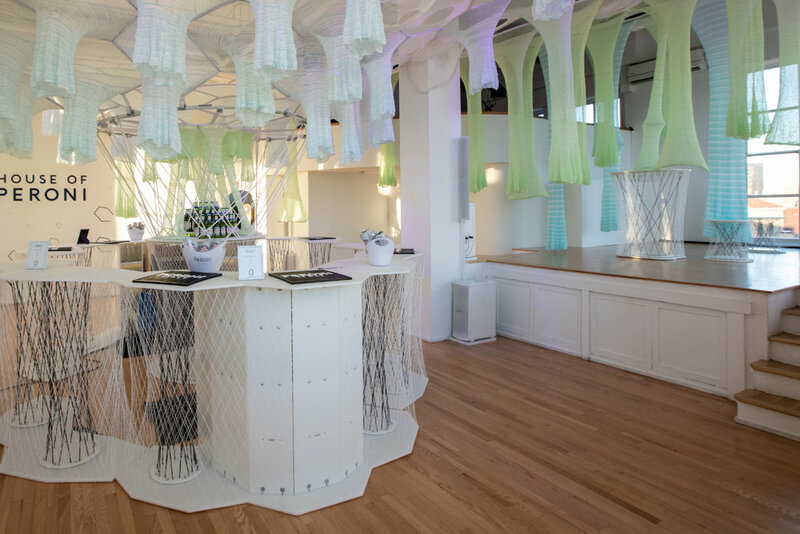 LUSTER features a lightweight knitted canopy structure of responsive and immersive tubular and cellular components that integrates a lounge, hightop tables, seating, and a bar. 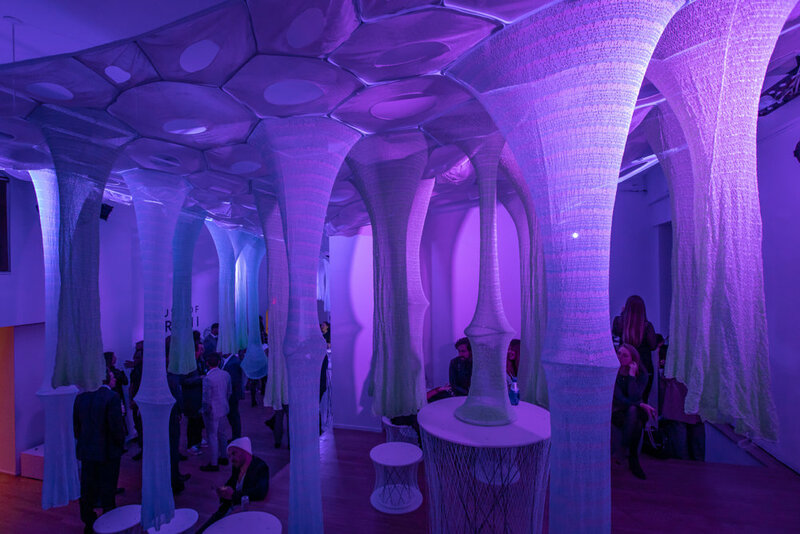 The transformative installation employs textiles, photo-luminescent, and solar active fibers that absorb, collect, and deliver light. It is a socially and environmentally responsive structure that is interactive, immersive, and transformative. This environment offers spaces of exchange, play, and engagement as the canopy filters light, casts dynamic shadows on the ground floor, and changes throughout the day and night. It is an open responsive system featuring digitally knitted lightweight, high-performing, formfitting, and adaptive materials. LUSTER is an experiment that embodies the theme “Style Rising” by taking risks through COLLABORATION across disciplines to INNOVATE architecture that is transformative, interactive, MINDFUL and socially engaging. LUSTER is human!